It is less than three months since the recast Markets in Financial Instruments Directive (MiFID II) came into effect and European markets are already changing. New block trading venues that had been slowly ramping up in recent years have now been fully unleashed, gaining traction as dark trading is curbed under the MiFID II regime. The double volume cap (DVC), which was initially delayed due to a lack of data, is a critical measure in reducing trading on previously popular dark pools across Europe. It imposes limits on the usage of the Reference Price (RPW) and Negotiated Transaction (NTW) pre-trade transparency waivers. A venue cap of 4% means that particular dark pool must suspend use of these waivers for six months, with a EU-wide cap of 8% meaning a market wide suspension of use of these waivers. When the European Securities and Markets Authority (ESMA) published data earlier this month kickstarting the DVC regime on March 12, it made clear that a large number of instruments would be initially affected by the cap – a total of 27 instruments for which dark trading went beyond 4% on a single trading venue in the past year and 1360 for which it went above 8% across all venues. The message from ESMA is clear: it may have been late implementing the DVC for unavoidable reasons, but it remains fully committed to the regime and dark pool trading is naturally therefore set for further decline. Market participants that had previously relied on dark pools to transact large orders with minimal impact will need to rethink their execution strategies. They will now need to be able to access a broad spectrum of venues to ensure they have ready access to liquidity. Even before the DVC came into effect in March, however, 2018 had seen a surge of volume on those newer block trading venues that offer a transparent, MiFID-compliant alternative to dark pools. Turquoise Plato Block Discovery, for example, broke new boundaries with a record daily value of €575 million traded on January 11, while Cboe Europe Periodic Auctions Book saw average daily notional volume rise by 885% in January to €296 million. But accessing multiple trading venues and determining which venue suits a particular order or strategy comes at a cost. Smaller entities may not have the resources needed to connect and manage interfaces with more than a small handful of execution platforms and systematic internalisers. At Vela, we provide both market data and market access solutions that can help firms in this important transition. Our feed handlers provide access to market data from a broad range of exchanges and platforms so that firms can get the data they need in real-time to manage their execution decisions. 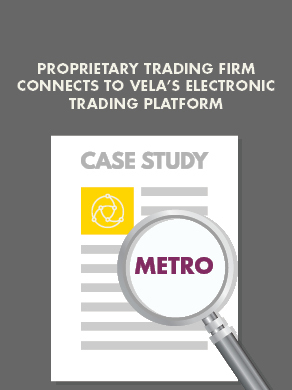 Meanwhile the Vela Market Access Gateway provides low-latency access to more than 110 trading venues with integrated pre-trade risks controls. The curbs on dark trading under MiFID II may be unpopular in some parts of the industry, but it is simply part of the new status quo and market participants need to adapt their trading practices to remain competitive. Understanding and connecting to alternative trading venues that will minimise market impact in a lit environment is going to be key to success in this new era for European trading.